PFW169 is our 6" x 9" Suffocation Warning Bag made with 1.5 mil poly barrier material. This bag offers superior clarity and has an anti-static adhesive strip for easy loading. Ideal for packaging toys, baby products, and more. Warning message is imprinted in English, Spanish, and French. Meets FBA compliance for Amazon. 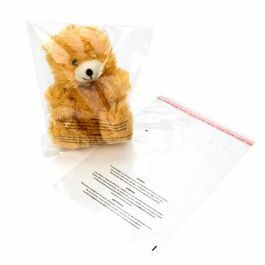 Suffocation Warning Bags alert your customers to potential hazards of plastic bags used for product packaging. PFW169 poly flap bags measure 6" x 9" and provide the suffocation warning message pre-printed in three languages. These bags are ideal for holding toys, baby products, instruction manuals for toys/appliances, small electronics, craft supplies and more. These poly bags are made with 1.5 mil thickness and feature an anti-static adhesive strip for efficient loading of your products. The adjustable flap seal accommodate products that are smaller than the bag. Most popular use is for packaging toys and children's products.